FAIRFIELD Villa general manager Paul Oakes insists things are on the up following Saturday’s victory over struggling Earlswood Town. Earlswood had taken the lead after 35 seconds before James Finn levelled on 26 minutes. Lewis Cosgrove had put Oakes’ side in front before Earlswood pegged them back to 2-2, only for Pete Jenvey to net the winner on his second debut for the club. The result saw Villa climb up to eighth in the Midland League Division Two table and Oakes said that his squad is starting gel. “I am really pleased with how things are looking at the moment,” he added. “The squad is starting to take shape and to win after a six week break from competitive football, it’s a nice feeling. Fairfield travel to Earlswood next week in the reverse fixture looking to make it back-to-back wins and Oakes believes their opponents will be on edge. “I think they will be really wary as they are still looking for their first win,” he said. “You have to give Earlswood credit though, they had 10 debutants on Saturday (January 30) and played like a team that was nowhere near the bottom end of the table. Despite the club jokingly Tweet on ‘deadline day’ that no business has been made, Oakes has announced he is signing his sixth keeper of the season. 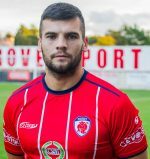 Colin Matthews is set to join the Villa from Division One outfit Cadbury Athletic and is in-line to start this Saturday, although the transfer is yet to be ratified by the MFL. Oakes said: “We’ve had problems with finding a permanent goalkeeper due to injuries and work commitments. “However, Matthews is a fantastic keeper and we are delighted to bring him to the club.